Ted Valentin: Good morning America! What are the most popular comedy clubs in Manhattan? Where can I do yoga near Santa Monica Beach, Los Angeles? What are the best barbecue restaurants in New Orleans? What are the most popular gay bars in the Castro, San Francisco? What are the best vegetarian restaurants on the Lower East Side, New York? Where in New York can I possibly run into... Woody Allen. Now there's an app for that. Or, rather, a website, or actually... 40 websites. 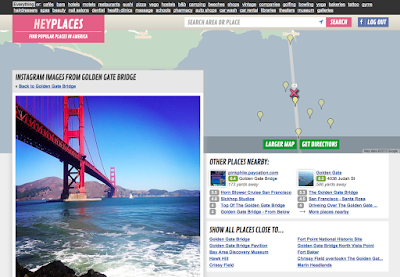 Heyplaces.com guides you to over 8 million places in the US. It works great on your smartphone, on your computer, iPad - or device of your choice. America is an amazing place! Dig in and start exploring cafés, bars, hotels, motels, restaurants, sushi, pizza, vego, hostels, bed and breakfasts, camping, beaches, shops, vintage, companies, golfing, bowling, yoga, bakeries, tattoo, gyms, hairdressers, spas, beauty, nail salons, dentist, health clinics, massage, schools, pharmacy, auto shops, car wash, car rental, libraries, theaters, museum, galleries and antique stores all over the US!